Face Down the Terrifying Foes of Humanity! In the Spinward Front, Imperial Guard troopers contend with deadly adversaries, from the rebels of the Severan Dominate to the Orks of Waaagh! Grimtoof to the forces of the Dark Eldar, Kroot, and Chaos. New foes including brutal Ork Meganobz, lethal Archonsk and dreaded Chaos Space Marines arm Game Masters with a host of options to challenge event the most experienced and skilled troopers. New information on the factions, politics, and battlefields of the Spinward Front provides details and ideas to enhance Only War campaigns. Rules for Formations give Game Masters resources to run steamlined combats on a squad scale, and Veteran Talents, Kill Markers, and new Medals allow grizzled characters to earn new bonuses and abilities for their heroic battlefield endeavours. Stand firm and prepare for the fight of your life! 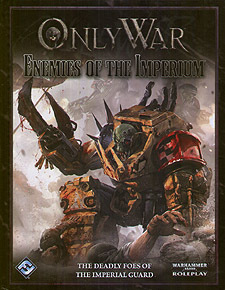 A copy of the Only War Core Rulebook if needed to use this supplement.